Preheat an oven to 250 °C. Cut cauliflower into large florets. Wash and wipe the pieces dry. Place a kadai on fire and heat oil in it. 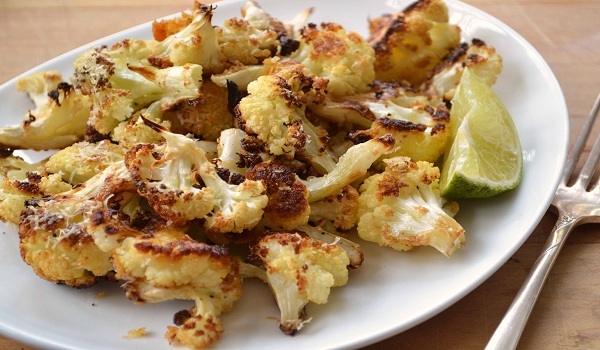 Fry the cauliflower for 3 minutes on low flame. Remove and keep aside. Once again heat oil in a kadai and add onions. Fry them till they turn light brown in color. Add garlic paste, ginger paste, coriander powder, chili powder, turmeric powder and garam masala powder. Stir fry for 2 minutes. Add curd and salt and sauté for 1 minute. Mix in the cauliflower and bake the preparation in the oven for 5 minutes. Recipe calls for curd. What kind of curd?